Smoking is one of the biggest public health threats in the world today, killing around 6 million people a year from lung cancer, heart disease and other diseases, according to a recent report from WHO. More than 5 million of those deaths are the result of direct tobacco use and more than 600,000 are the result of non-smokers being exposed to second-hand smoke. There is no such thing as a safe level of second-hand smoke. In this regard, all delegates, staff and visitors to UN Headquarters are reminded of the strict no smoking policy mandated by the General Assembly in its resolution A/RES/63/8 and stipulated in ST/SGB/2003/9. 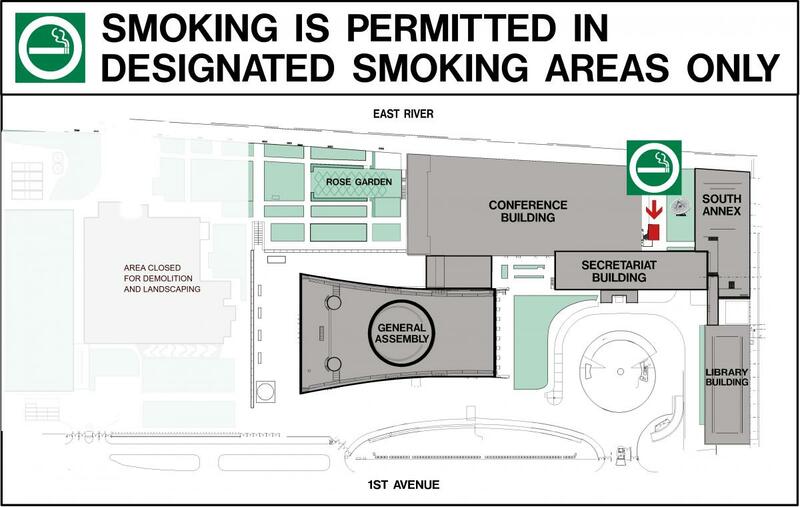 A designated exterior smoking area is available in the South Garden and signs showing the shortest route from the Secretariat lobby and the General Assembly and Conference Building main areas have been posted. Unfortunately, some colleagues have not been adhering to the measures put in place. There has been smoking in the Rose Garden as well as other areas inside the buildings. This can create a major fire hazard with potentially serious ramifications for those identified as being in breach of the no smoking regulations. We would note that there are air intakes which supply the ventilation systems of the Conference, General Assembly and Secretariat buildings along the walls on the South and West sides of the Rose Garden and any smoke in this area is drawn into the building; the second hand smoke being created therefore affects other colleagues. This is an unacceptable situation and there have been complaints from occupants throughout the complex including as high as the 5th floor of the Secretariat Building. Smokers are kindly reminded they are not permitted to smoke in the Rose Garden or any other place in the buildings or on campus except the exterior designated smoking area in the South Garden, shown here. The no smoking policy at headquarters is explained in ST/IC/2016/10.